A Report of a Hike with Seven People and Six Llamas across Virginia, Matterhorn, and Kerrick Canyons. Saturday, July 26: The flight out. After a smooth trip from Grand Rapids we drove to our VRBO rental house in Sonora, which turned out to be much better than a hotel. We had lots of room for the seven of us, ranging in age from the fifties to the seventies. We’ve used mules in recent years to haul in our gear to a base camp. This year we wanted to cover more ground, so we resolved to try llamas. Potato Ranch Llama Packers in Sonora rents llamas to experienced hikers. We gave it a try. At 9:00 a.m. we headed out to be trained. Greg Harford does a fine job. In three hours he gave us a thorough introduction to the care and handling of his gentle, capable beasts. There’s nothing difficult about it, but there are a lot of details. Dan quickly bonded with the llamas and became our lead llama wrangler during the following week. Llama panniers need to be balanced, which takes practice. We returned to our General Headquarters and spent most of the afternoon figuring out how to load the packs. We had a period of panic when all of our panniers seemed to be greatly overweight. It turned out the scale we were using was defective. Once we figured that out things went more smoothly. It is about two-and-a-half hours from Sonora to the Green Creek trail head, and we needed to spot one of our cars at Twin Lakes,where we would exit. We left at 5 a.m., meeting Greg Harford along the way. Three of us went with Harford, four of us detoured to Twin Lakes to leave my car. Since the panniers were balanced, the llamas needed only to be saddled and loaded. We were on the trail shortly after 9:00. There are various ways of leading llamas, but we decided that the easiest was to link all six together, That way, several of us could press forward to scout out campsites, one person could lead the llamas, and the slower members of the party (of whom I am the chief) could follow along at their own pace. We tried out various people as the llama leader, and by day 2 concluded that Dan (the “llama whisperer”) was the best person for the job. I’ve always told my hiking companions that although one has to be prepared for rain, it rarely happens in the Sierra in summer (aside from an occasional quick and friendly afternoon thundershower). That has been true for nearly all of my 40 years of hiking in the Sierra. This year was an exception. It was overcast when we started and got less friendly as the day went on. We had thought about camping at East Lake, which Greg Harford said was not ideal since grazing was limited. The campground scouts found no congenial campsite, so since the afternoon was young we decided to press on into Virginia Canyon. Soon it began to rain. It wasn’t a downpour, but rather a steady and chilling rain. After Hoover Lakes, with our heads down and in hiking mode, we managed to walk right past the Summit Lake trail junction. I’m embarrassed to admit it, but we did it. The sign is rather lower than usual, but we really should have seen it. As a result we hiked about an hour of unnecessary uphill before we realized our error. We turned back and found the junction, then headed up to Summit Lake. It was still damp, we were tired, and we’d taken the llamas about as far as they wanted to go for the day. 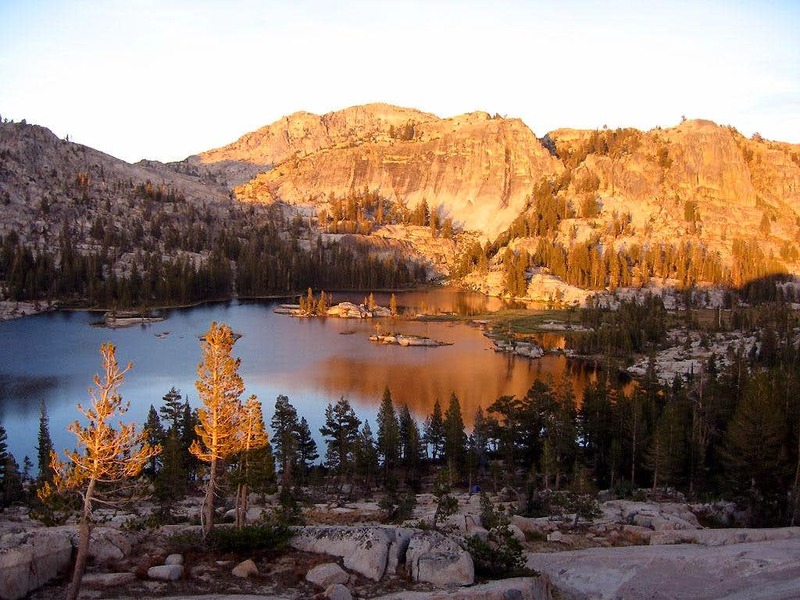 We decided to camp at Summit Lake, finding appropriate campsites at the west end. This was our first evening of llama care. We staked out the llamas, a process we got better at as time progressed, provided them with good grazing, some llama pellets (rather like candy for children), and fetched water. We then set up our tents and being thoroughly exhausted prepared dinner and settled in for a well-deserved rest. The morning was somewhat overcast, suggesting more rain would come. It was our first morning of doing llama chores. We needed to be sure the saddles were put on properly and the packs were balanced. It took until about 10 a.m., but there were no major difficulties. We headed down into Virginia Canyon, a pleasant stroll, even though the rain began again. Given the previous day our goal was modest, the junction with the Pacific Crest Trail. To my surprise there aren’t great camping sites at the junction, but there was an acceptable site with decent grazing. The weather did not encourage pressing on. Our second morning with the llamas went smoothly. By now we had the routine down. The panniers were soon balanced and loaded and Dan took his position as chief llama leader. There was a bit of rain as we left but it soon diminished. The sky remained overcast, which was actually pleasant since it made the hike up from Virginia Canyon cooler. We took a break at Miller Lake before heading down into Matterhorn Canyon. On the way down we had our one moment of llama panic. The descent is steep and the llamas weren’t happy about it. Sunny D, the lead llama, started trotting downhill and showed a distressing interest in cutting switchbacks. Dan tried to keep up, a dangerous thing, and soon the llamas got tangled in the brush. Quick uncoupling was needed. After that Dan learned that keeping the lead llama on a short leash was the way to maintain control and we had no problems thereafter. We found a great camp site just south of the junction, with a legal fire ring and good views. There were even several deer eyeing us curiously. Deer in national parks generally don’t view humans as a threat since hunting is illegal. There were also energetic fish swimming around in Matterhorn Creek. By now the group was complaining about Tux, my llama, the best in the Sierra Nevada. Now Tux had a rough childhood. Male llamas tend to establish dominance by nipping at the hindquarters of other males, and Tux had been picked on. He was nervous if any other llama was behind him. As a result he was always the last llama in the train, and my hiking companions were not always complimentary about his performance. Since, as usual, I was considerably to the rear of the group I was not available to defend Tux. Fortunately, as a trained counselor Dan stepped in and did some llama counseling that evening in Matterhorn Canyon. Llamas, it turns out, rarely receive such professional attention. Now, were anyone else to claim the receipt of such a note I would be most suspicious, but since Dan is a person of great probity I can only believe that the llamas somehow found a way to express their appreciation. It is disappointing to hear that Tux is still having difficulties. We were getting better at getting off in the morning. We had the llamas ready to go by 9:45 and headed up the trail. It’s a good uphill stretch to Benson Pass, much of it shaded. The view from Benson Pass is a fine one, both to the east and west. We found a good site at the west end of Smedberg, attended to the llamas, set up camp, enjoyed dinner, and admired the view. Most of the group took a pleasant hike around Smedberg, a most attractive lake. July 31 was the day my retirement took effect. John, who distressed Dan, Nick, Jane, and me by preparing dinners considerably more elegant than our freeze-dried meals, prepared a most tasty dessert in honor of the occasion. I will say that although freeze-dried dinners taste good at 10,000 feet, I’ve never found a freeze-dried dessert that I liked. John’s effort was a definite success. I became professor emeritus in culinary style. That evening I made a distressing discovery. Somewhere between Matterhorn Canyon and Smedberg Lake, I lost my rental car key. I thought I had cleverly put it in something big enough so that I couldn’t lose it — but lose it I did. I spent an uncomfortable night wondering what to do. We were due out Sunday afternoon, and all of us had plane flights back to Michigan on Monday morning. Since it seemed unlikely that we could resolve the situation Sunday afternoon, the best plan I could devise was to break a window of my rental car, spotted at Twin Lakes, which would at least allow the other six in the group to retrieve their possessions and, with the presumed help of Greg Harford, get the three people in my car to Sonora, where perhaps they could pay someone to drive them to the airport in San Francisco. I was not a happy camper. I broke the news of the missing key to the group the next morning. They took it rather well. I outlined my plan and hoped for better ideas. Jane and Nick proposed hiking back toward Benson Pass looking for it, but I nixed their kind suggestion. It could have gotten lost anywhere between the Matterhorn Canyon floor and Benson Pass — and I knew we had the roughest day of hiking before us. Benson Lake is a popular camping spot, but we had to get to Kerrick Canyon so we hiked past. It was a challenging day. First one climbs out of the Smedberg basin. Next comes a long descent to the Benson Lake junction. Then there is a stiff climb over Seavey Pass (the poorest excuse for a Sierra pass I’ve encountered). Then a fairly easy drop into Kerrick Canyon. The llamas were tired by the time we got to Benson Lake junction. As we began the climb up, Sunny D. decided he had had enough and plopped down in the middle of the trail, showing no inclination to go further. After a quick council, we put Joe in the lead. He behaved admirably and the llama train moved. As the day went on I asked those we met if they perchance had a satellite phone. I wasn’t expecting to hear someone say they did. However, in one of those fortunate encounters one sometimes has in the Sierra, I met a CCC trail crew doing fine work repairing and improving the trail. I explained our situation — and to my surprise they had one for emergency use. The leader said I could make a quick call. I succeeded in getting my son, and in about two minutes explained what had happened, asked him to contact the rental car company, and figure out some sort of solution by the time we emerged two days hence. I felt a lot better. I wasn’t sure what would happen, but I had confidence in my son’s problem-solving ability. As I caught up with the rest of the group a ways up Kerrick Canyon I reported the good news. Things were looking brighter. About a mile up-canyon from the junction we found a decent developed campsite blessed with a fine established fire pit. And we had the llama routine down by now. Everyone pitched in, and soon the llamas were grazing contentedly while we went about the rest of the evening’s business. One of our party had boot problems — the soles were separating. This could have been a problem, although not an insurmountable one, had not Greg Harford had the foresight to send Gorilla Tape along with us. It worked. I wouldn’t have believed it if I hadn’t seen it. It held the boots together for two days, including the steep descent from Peeler Lake to Twin Lakes. The stroll up Kerrick Canyon is a pleasure. It is a gentle, open rise with good views all around. After the previous day an easy hike was welcome. Our National Geographic map indicated that there was no camping at Peeler Lake, so we reluctantly were going to head for Snow Lake, another 600 ft. or so of climbing. Fortunately, we met the only two people we encountered that day in Kerrick Canyon at the junction, who informed us that the map was outdated and that camping was now permitted. We cheerfully kept up the canyon until the Peeler Lake junction. Peeler is a fine lake and we reached a campsite with suitable grazing rather early. At that point John had an inspiration: he and I could hike out to Twin Lakes, retrieve the car spotted at Green Creek trail head, and straighten up the mess with my lost key. The rest of the group could hike out on Sunday as planned. At this point, we had no idea how things would turn out — I was depending on my son to have some sort of solution waiting once we emerged from the backcountry. John and I left the group at Peeler and headed down to Twin Lakes, which we reached in a reasonable time. The first step was to call my son, who had performed admirably. It would have been possible to have the car towed to Reno to have a key made, which would have been both time-consuming and expensive. However, there is one, and only one, locksmith on the whole east side of the Sierra. My son had contacted him and he was expecting us. I called him and he agreed to meet us at Twin Lakes at 8:00 a.m. on Sunday morning. Now we needed to retrieve our second car from the Green Creek trail head. I walked into the friendly restaurant and asked the bartender if there might be an employee interested in earning some money by making the two-hour round trip. There was. By evening we were in Bridgeport looking for a motel. Every one was full. That was a bit of a problem, since all our gear was at Peeler Lake. However, Juan, who had brought us to our car, had mentioned we could sleep on his floor if necessary. We drove back to Twin Lakes, found him, and the offer was still good. Before getting to sleep we had a fascinating conversation. He had come to the U.S. from Mexico 24 years ago, and risen to a responsible position. He married and raised two kids. His son just graduated from the University of California at Davis, and his daughter is working on a degree at California State University—Northridge. It struck me what a blessed country this is. A poor Mexican comes to the U.S., works hard, and sees his children prosper. I suppose it’s my own family history several generations back, and that of many Americans. Sunday morning the locksmith showed up as promised, worked his electronic magic to program a chip to start our car, and fifteen minutes later there was the cheery sound of a Dodge Grand Caravan coming to life. John and I had breakfast and headed to the Bridgeport Ranger Station with the thin hope that someone might have turned in the lost key. Nope. We were back at Twin Lakes by noon, where Greg Harford showed up as promised. Our five fellow hikers arrived at the trail head fifteen minutes earlier. The llamas were unloaded, Harford got them in his trailer, and seven contented hikers headed toward San Francisco. We drove to our hotel near the San Francisco airport and enjoyed a good night’s sleep on good mattresses and were ready to fly back to Grand Rapids on Monday morning. Notes of possible use to those planning a hike in the area (with comments on llamas). 1. Some comments on hiking with llamas. a. We recommend them. Given the age range of the group (from the 50s to early 70s), we wouldn’t have done this hike with backpacks. Once one has the routines down llamas are a pleasure to work with. Unlike horses or mules they don’t kick. They have two-towed hooves, need no steel shoes, and are far easier on the trail than mules or horses. Their droppings are also less prolific and annoying. They eat almost anything green. Llamas are very good at adjusting to the speed of the person leading them. b. The cost is comparable to mule and horse packers, with the advantage that one needs no packer along. Harford rents llamas for $60 a day. Since we had rental cars and could not pull the trailer he also rents, he delivered and picked his animals up for a reasonable charge. Everything together cost us about $400 per person for the week. c. The first task after arriving at a good campsite is to get the llamas settled and the panniers unloaded. Usually we attached three or four to a picket line, and secured the others with “bags of rocks,” nylon sacks that one fills with enough convenient rocks to keep the llamas from wandering off. We’d usually give them a handful of llama pellets and make sure they had enough to drink (they don’t drink that much, being members of the camel family). After that, we’d give an occasional glance to make sure they were content, which they always were. In the morning we’d load the panniers, saddle the llamas, load them up, and check to be sure we weren’t leaving any llama gear behind. d. The one thing most people ask about llamas is “Do they spit?” The answer is yes, but seldom at people. It’s a form of llama-to-llama communication. Our collective of llamas occasionally spit at each other, but it was hardly a problem. e. They are a cause of great interest on the trail. Everyone wants to know about them. For some children encountering a llama train was a highlight of their trip. Llamas are gentle, and children can stroke their necks with perfect safety. If I were taking kids on a hiking trip I’d definitely consider llamas — but I would want another adult along to make sure all the llama chores are accomplished properly. f. The one lesson we learned is that going downhill with a train of six llamas can be problematic. We had the moment of fear described above. Keep them on a short lead. The last llama in line can get whipsawed around switchbacks. At such times, splitting the group into twos or threes is a good idea. 2. There is a good campsite (3-4 tents) at the west end of Summit Lake. 3. There are splendid campsites in Matterhorn Canyon. We were south of the junction. 4. Smedberg Lake can get crowded. There is one obvious campsite at the west end of the lake. There is a use trail leading to another good area that easily handled our group of seven a bit beyond that. Several of our group hiked around the lake and found other campsites on the northeast shore, although they are a bit off-trail. 5. It’s a stiff hike with lots of ups and downs from Smedberg to Kerrick Canyon. Many people camp at Benson Lake, but we needed to keep moving. The junction of the PCT and the Kerrick Canyon trail offers no good campsites, although we were told there we some decent ones south of the junction. Instead, we pressed on about a mile north, where the canyon opens up and there was a good site. 6. We had an outdated map that showed “no camping” at Peeler Lake. Fortunately, we met two hikers coming down from there who let us know that it was outdated. There are some spots with “no camping” signs, but there are numerous decent sites. However, Peeler Lake is popular and getting there early is a good idea. The destination this year is Northern Yosemite, a relatively remote area of the park, although some of our hiking will be along the Pacific Crest Trail. Unlike recent hikes, where we set up a base camp and did day hikes from there, this time we will be moving every day. Llamas will carry most of our gear. It is an extraordinarily dry year so far in the Sierra, so we should assume a ban on fires for the entire trip. July 26 (Saturday): Fly to San Francisco, drive to a motel near Sonora. We’ll need two cars, since we will begin and end in different places. July 27 (Sunday): Llama training at Potato Ranch Llama Packers. Day hike, shopping, and relaxation as needed for the rest of the day. July 28 (Monday): We will drive to the trailhead, spotting a car at Twin Lakes. Dan Vandersteen will remember the “providential van” from an earlier hike, but we shouldn’t depend on it happening again. Our llamas will be taken to the Virginia Lake Trailhead (9880 ft). Hike over Summit Pass (10,183 ft) and into Virginia Canyon, camping at around 8520 ft.. I’m told eight miles a day is a reasonable figure for traveling with llamas. That will get us well into the canyon. July 29 (Tuesday): Hike about six miles past Miller Lake (9446 ft) into Matterhorn Canyon (8480 ft). July 30 (Wednesday): Hike about seven miles over Benson Pass (10,080 ft) to Smedberg Lake (9129 ft). July 31 (Thursday): We will hike the four miles or so to Benson Lake (7600 ft). Not far, but there is some considereable up and down. August 1 (Friday): About a four-mile hike over Seavy Pass (9120 ft.) to Kerrick Canyon (8880 ft). Again, the distance isn’t great, but the altitude varies considerably. August 2 (Saturday): Eight miles to Peeler Lake (9160 ft). August 3 (Sunday): We’ll want an early start, since this will be a long day. We’ll hike down about eight miles to Twin Lakes, where our llama folk will retrieve their stock and we will get our second car (while everyone but the drivers get their showers in) and drive to a hotel near the San Francisco airport. August 4 (Monday): Fly back to Grand Rapids. A 2010 hike report from some of the ground we will cover. Don’t worry about their accounts of swarming mosquitoes and snow. Both will be long gone by the time we get there. The winter of 2009-2010 had considerably more snowfall than usual. That was the year of our Red Mountain Basin hike — those who were there will remember more bugs than one would like. Another 2010 report covering much of our ground. If you use Google Earth, enter “Smedberg Lake, CA,” and you will be in the middle of the area.